Looking for a good introduction to decsion science? The Psychology of Judgement and Decision Making. 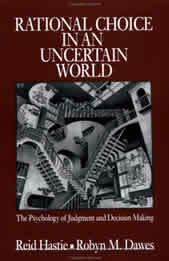 Intended as an introductory textbook for both undergraduate and graduate students, Rational Choice In An Uncertain World lays out the foundations of decision science. In a non-technical style, Hastie and Dawes compare basic principles of rationality with actual behavior in decision-making. This book is not about what to choose, rather about how we choose. Reid Hastie is a Professor of Behavioral Science on the faculty of the Graduate School of Business in the Center for Decision Research at the University of Chicago. His primary research interests are in the areas of judgment and decision making (legal, managerial, medical, engineering, and personal), memory and cognition, and social psychology. He is best known for his research on legal decision making (Social Psychology in Court [with Michael Saks]; Inside the Jury [with Steven Penrod and Nancy Pennington]; and Inside the Juror [edited]) and on social memory and judgment processes (Person Memory: The Cognitive Basis of Social Perception [several co-authors]). Currently he is studying: the role of explanations in category concept representations (including the effects on category classification, deductive, and inductive inferences); civil jury decision making; the role of frequency information in probability judgments; and the psychology of reading statistical graphs and maps. Looking for a good introduction to decsion science? was written on September 13, 2004 and filed in Books.